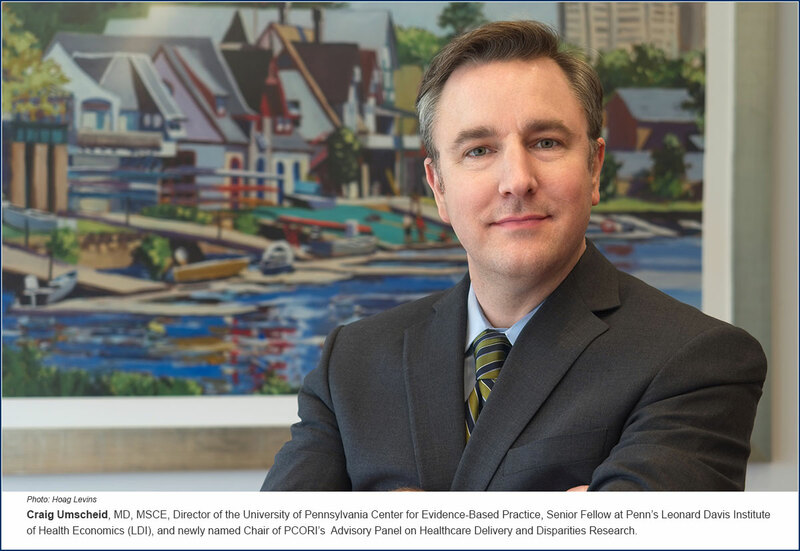 Craig Umscheid, Director of the Penn Medicine Center for Evidence-Based Practice, has been named both Chair of a national advisory panel that recommends new areas for PCORI-funded research, and a new steering committee member of the AHRQ-supported national network focused on how to make new research evidence available to clinicians in their daily work. Umscheid, MD, MSCE, Vice Chair for Quality and Safety in the Perelman School of Medicine's Department of Medicine and a Senior Fellow at Penn's Leonard Davis Institute of Health Economics (LDI), is one of the country's leading authorities in synthesizing and integrating biomedical and health services research evidence into electronic health records-based clinician decision support systems. He has been named Chair of the Patient-Centered Outcomes Research Institute Advisory Panel on Healthcare Delivery and Disparities Research (HDDR) and also joins the Steering Committee of the Agency for Healthcare Research & Quality's Patient-Centered Clinical Decision Support Learning Network. The HDDR panel is co-chaired by Umbereen Nehal, MD, MPH, the Associate Medical Director of MassHealth, the Massachusetts Medicaid program. The 34-member PCORI HDDR panel includes physicians, nurses, pharmacists, and representatives from the patient advocacy, academic research, hospital management, insurance, and health sciences consulting fields. Its purpose is to advise and assist the PCORI Board of Governors as that body sets its national research agenda. Where we're less mature is actually making synthesized evidence available to providers at the point of care when they need it, most often in the form of clinician decision support within an electronic record. Created in 2010 as part of the Affordable Care Act, PCORI is a private, nonprofit organization that funds research projects related to health care delivery. PCORI investigations are different from "basic" academic research, or the scientific exploration of a problem without regard to any immediate pragmatic goal. Instead, PCORI funds "applied research" projects focused on the specific, reported health care delivery needs of patients and their clinicians. "The 'patient-centered' aspect is a very real part of this," said Umscheid who has served as a HDDR panel member for two years before being named Chair. "All the requests for proposals coming out of PCORI have an expectation that you'll have a diverse group of stakeholders informing the work. That’s a real sea change from what we were doing as academic investigators ten years ago where we might put together a grant for the NIH and not think through how to engage patients in the process." An Associate Professor of Medicine and Epidemiology at the Perelman School and a clinical informatics expert, Umscheid refers to himself as someone "working to close the knowing-doing gap" at the clinician/patient intersection of health care delivery. Throughout the last century, many in the U.S. physician community have resisted the idea of having a central authority that defines how medicine should be practiced; an authority that could develop treatment guidelines that could be imposed on clinicians, particularly in government-funded programs like Medicare and Medicaid. In the mid 1990s when the federal office now known as the Agency for Healthcare Research and Quality (AHRQ) began to produce those very kinds of clinical practice guidelines, it sparked a physician-driven revolt in Congress that nearly shut that agency down. Ultimately, a new Agency director was appointed -- John Eisenberg, MD, the former Penn professor and founding chief of Penn Medicine's Division of General Internal Medicine -- and he adopted a different approach. Eisenberg established a new program of AHRQ "Evidence-Based Practice Centers" (EPCs) across the country where academic research was paired with the input of professional medical organizations to create a body of evidence syntheses to inform guidelines. The AHRQ-funded National Guideline Clearinghouse (NGC) is now a publicly available online database with more than 3,000 up-to-date clinical practice guidelines. Since then, a new level of interest in evidence-based medicine and clinician decision support systems has also been driven by new hospital informatics technologies and the accelerating speed and volume at which both biomedical and health services research around the world produces new evidence. In his multiple roles as Director of the Penn Medicine Center for Evidence-Based Practice, Senior Associate Director of the ECRI-Penn AHRQ EPC, and the new positions at PCORI and the Learning Network, Umscheid is on the nation's front line of devising new and more effective ways to synthesize this tsunami of new information and insights in ways that can inform the daily decisions of physicians. "What I've focused on over the years," he says, "is synthesizing evidence to inform institutional decision-making for large integrated systems, synthesizing evidence to inform clinical guidelines by societies and governments, and synthesizing evidence to inform coverage decisions by the government and regional payers." He acknowledges the history of clinician resistance to certain kinds of decision support but notes he has found that the situation eases "if you're less dogmatic about evidence-based practice and you realize that most of medicine is gray and there is often no one right thing to do." "We now have a lot of resources that synthesize evidence to inform guidelines for clinicians -- from AHRQ's NGC to the professional societies to Cochrane reviews," Umscheid said. "Where we're less mature is actually making that available to providers at the point of care when they need it, most often in the form of clinician decision support within an electronic record." 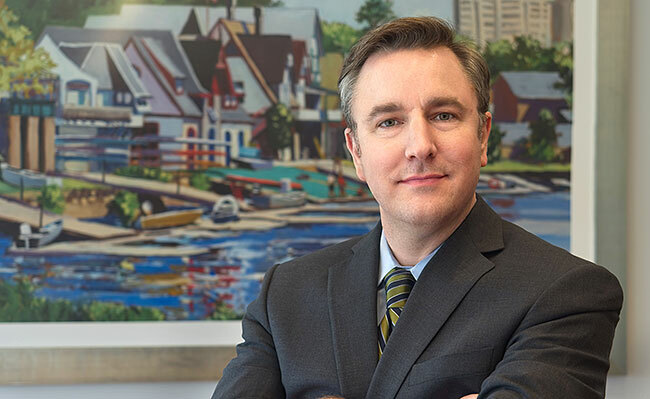 "If the synthesis and dissemination and implementation of that evidence into practice through decision support systems is making it easier for providers to do the right thing for patients, then I think providers are excited about it," Umscheid said. "To be honest, the biggest wins are when providers don't even know you're helping them do the right thing because it's so seamlessly integrated into their workflow that they do it without thinking much about it." Craig Umscheid, Director of the Penn Medicine Center for Evidence-Based Practice and LDI Senior Fellow, has been named both Chair of a national advisory panel that recommends new areas for PCORI-funded research, and a new steering committee member of the AHRQ-supported national network focused on how to make new research evidence available to clinicians in their daily work.